Have you ever wondered: “What is my dog thinking when he barks at the door?” Well, chances are he’s thinking about running freely in and out of the house. Dogs, just like humans, want their freedom. They want to chase a bird, roll in the grass, and scratch a tree. Did you know that you don’t have to leave your dog inside the house for hours when you’re away at work? We have the perfect win-win situation for you! 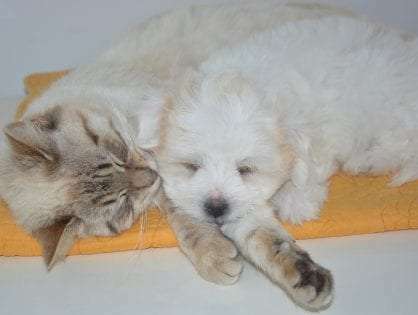 Simply install a pet door through which your four-legged friend can move in and out as they please. Installing a dog door can be quite simple if you have a wooden door for example. However, things might get slightly more complicated when you have a glass French door. Let’s explore the best ways of installing a dog door in a French door. You can’t buy a pet door or less alone install one if you don’t know the type of your French door. In general, there are two types of French doors. The first type is the door that has a solid piece of glass with grid-work. The other type of French door has multiple panels of glass that are individually framed. If your door has one panel of glass with decorative grid-work, then installing a pet door might be a little challenging. You’ll need to hire a glazier to cut a new piece of glass for you with a hole to fit the dog door. If your door has various pieces of glass that are individually framed, then the installation might be less complicated. You simply need to remove one or more pieces of glass and fit the dog door in their place. How many pieces of glass you need to remove depends on the size of your dog. The pet door should be custom-built to fit nicely into the hole. Buy your dog door for glass door today. Installing a dog door in a glass French door is not a DIY task. You should be handy with tools and comfortable with cutting glass. If you don’t have any experience with cutting glass, you might want to consider getting help from a professional handyman. If you hire a handyman to help you with the installation, keep in mind that they will charge you an hourly or per-project fee. The installation might cost from $120 to $350, plus the price for the doggy door. Measure your dog from the ground to his shoulder. When selecting a dog door, learning how to measure your pet is essential. Why? Because you want to get the right fit. Hire a glazier to help you with the installation. They will cut the glass pane and insert the dog door. According to your dog’s measurements, buy the most appropriate dog door. Depending on your dog’s size, the dog doors for glass doors come in different sizes, from small and medium to extra large. If you get a door with a self-closing magnetic flap, your dog will have no difficulties moving in and out of the house. You should consider getting a door with a 4-way locking feature that can secure your dog inside or outside, giving you peace of mind. Now that you have chosen the most suitable dog door, the glazier will be able to remove the glass pane from your door and replace it with a new one that has a dog door installed at the bottom. 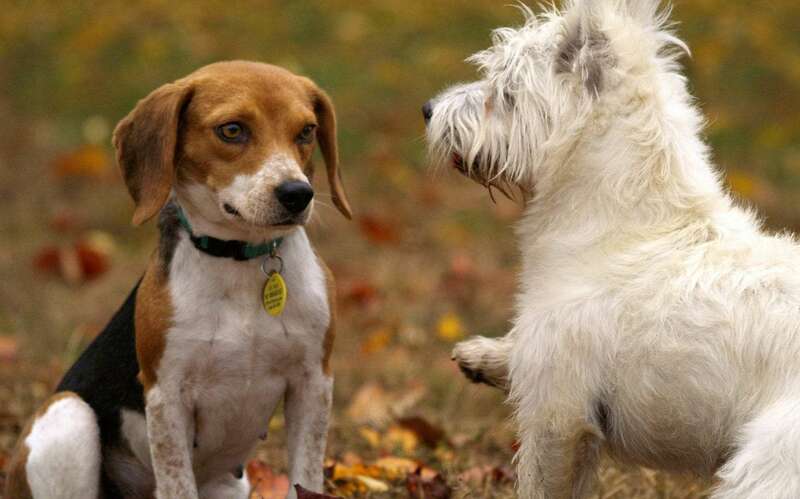 Let your dog enjoy his newfound freedom. Measure your dog from his feet to his shoulder. When selecting a dog door, learning how to measure your pet is essential if you want to get the right fit. 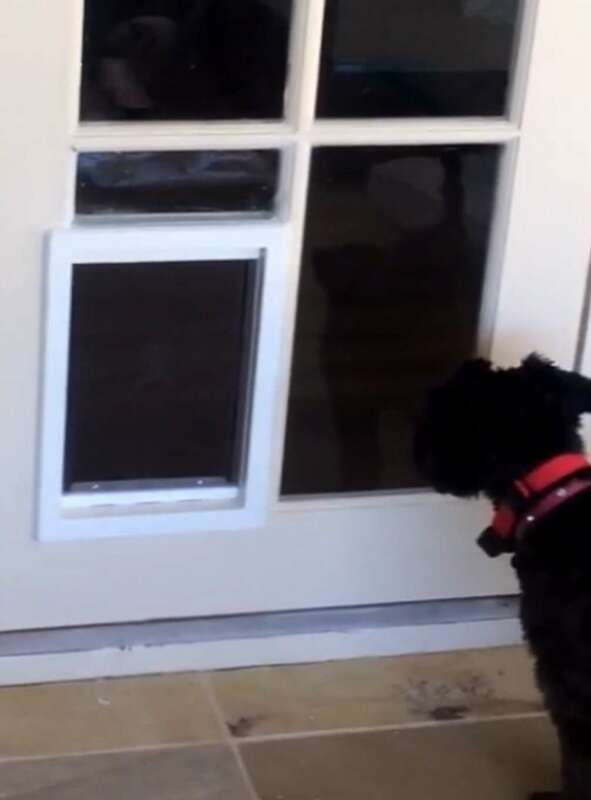 As glass on French doors can be high, be careful of how high your dog door might be. If you’re an owner of a small dog, it’s recommended to cut through the door frame to get to a suitable height. Depending on the height of your pet, choose a glass pane that you would like to replace with the dog door. It would be a smarter idea to hire a glazier to help you remove the glass pane. Once the glazier cuts through your glass door, take careful measurements of the opening of the hole. According to your dog’s measurements, buy the most appropriate dog door. Depending on your pet’s size, the dog doors for glass doors come in different sizes, from small and medium to extra large. Get a free quotation here. And there you have it! That’s everything you need to know about installing a pet door into a French door. Hopefully, we made things a little less complicated and gave you clear instructions on what needs to be done. Now it’s your turn to install a doggy door and open a world of opportunities for your dearest friend! Wondering what other types of dog doors are there? 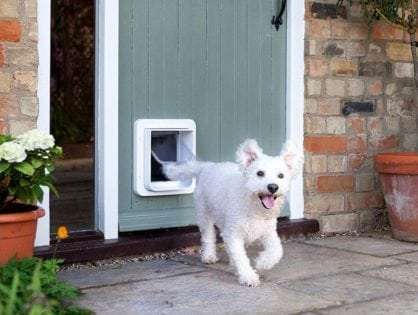 Read our Ultimate Guide to Dog Door Types in Australia for 2019 and find out!